In between the flurry of stories about Fox Broadcasting declining to air the mysterious 13th episode of Joss Whedon’s “Dollhouse” and concerns that the series may be summarily canceled, an interesting tidbit appeared on Twitter from the Whedon camp. Beyond the thread of hope it gives to fans of the series, this message implies that the fate of “Dollhouse” is largely in the hands of those who watch the Fox network broadcast of the show. People viewing the same content on their digital video recorders (DVRs) or at Hulu.com a day later are apparently less important to the powers at Fox who control the network’s programming. DVR viewing is admittedly problematic since most viewers skip over the advertisements which are intended to fund the “free” content. But Hulu should be a marketer’s dream, since viewers are unable bypass the advertisements (and, because of their brevity, there is little incentive to walk away and do something else until the spots are over). In addition, user tracking data for sites like Hulu (as well as some DVRs like the TiVo) is much more accurate and more detailed than that of broadcast television. Furthermore, although the details are a bit murky, there is evidence that Hulu’s ad rates are as good as or better than those of broadcast television. In March, 2008 Hulu CEO Jason Kilar claimed that Hulu’s ad rate was better than that of primetime network programming. In June, 2008, a Silicon Alley Insider article also stated that Hulu’s ad rates are “higher than network TV.” The latter, however, cited a range of $25 to $30 CPM (per thousand views) for ads on Hulu, which is in the same neighborhood as the average 30-second primetime TV spot according to the Television Bureau of Advertising, an industry trade association. Whether or not “Dollhouse” (or any other network show) survives to run another season, it’s unfortunate that the program’s fate may rest on the actions of one segment of its viewing audience. To the extent this is true, it’s another example of how industry practice lags behind the current state of media evolution. I remember when Dollhouse was first announced that one reason Joss cited in working with Fox on another Friday evening program was that they understood the landscape of television had changed. I don’t have the quote verbatim, but he said something about Fox having more realistic expectations about the live viewing audience in what is traditionally a death time slot, and they understood much of Whedon’s fan base would watch at other times. It appears that isn’t the case, which is really a shame; c’mon Fox, get with the times already! 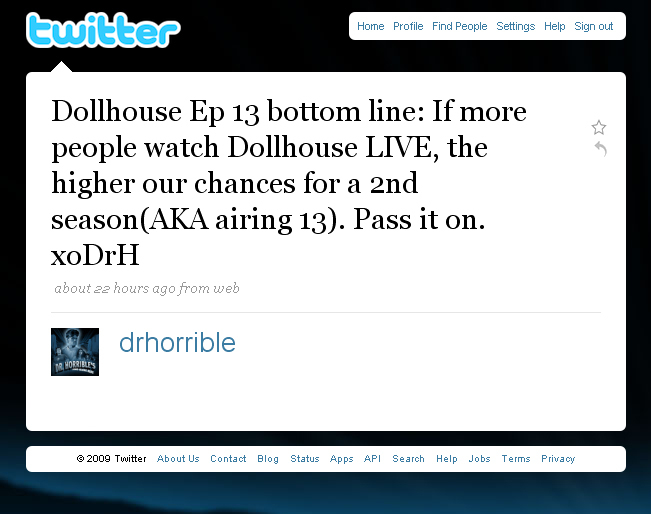 Here’s hoping Dollhouse makes it, as the show has gotten pretty interesting, and in the sea of nonsense reality shows and predictable “dishwasher television” like CSI: NY, it is getting harder and harder to find interesting progrmas. Good point. You would think that Fox would have learned a lesson from Whedon’s earlier effort, “Firefly.” That show did poorly in the ratings in its original run on TV, but gained a growing fan base — and generated brisk sales — on DVD. It did so well on DVD, in fact, that Universal produced Serenity, a feature film based on the series. It’s possible, I suppose, that I’m reading too much into an offhand tweet from the Whedon camp. But the language used (along with the added caps for emphasis) indicate that it’s the live audience that matters most to Fox. If so, this seems rather myopic given the various venues — including News Corp.’s own Hulu — that can generate revenue from the series. Especially pertinent to the discussion is professionally created and licensed content (Hulu) versus user generated content and content that skirts the borders of fair use (Youtube), and the CPMs they are likely to generate. Monks sworn to a vow of silence figuring out how to perform the Hallelujah Chorus in a humorous manner. How else could this have gotten so many views? There must be a way to monetize Youtube… Wharton students, let’s see some creative solution to that problem! Thanks for sending the link to the video, Tim. It’s very charming. Google is monetizing YouTube — just at a rate that, at present, may not exceed its costs. One problem they face is that they can only monetize a small percentage of their content — the material for which they have identified the copyright holder. Back in July, 2008, Mark Cuban estimated this included only 4 percent of the content hosted by the site. With their recent partnerships with media companies — like CBS, MGM and Disney — and their new ContentID scheme, YouTube is working to increase the amount of content they can use to drive revenue. But I suspect it’s still only the tip of the iceberg.